Some of those who attended a meeting opposed to changes to breast cancer services at Craigavon Area Hospital. Armagh, Banbridge and Craigavon Council has backed a campaign to save breast cancer services at the local hospital. A notice of motion was brought forward by Lord Mayor Julie Flaherty at the council’s last full meeting before the local government election. The motion read: “This Council notes with grave concern the public consultation under the ‘Reshaping Breast Assessment Services’ which could lead to the closure the local Craigavon Area Hospital Breast Clinic Services. “The closure of this highly efficient unit would have a devastating effect on many of our constituents who rely on this life saving service locally and those who travel from throughout the Southern Trust area. 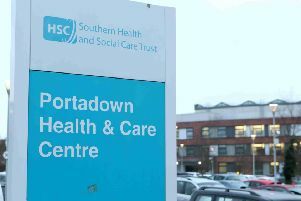 “That this Council writes urgently to the Permanent Secretary of the Department of Health, the Health Board and the Secretary of State in reply to this latest consultation paper in order to support this service being retained at Craigavon Area Hospital. Cllr Flaherty said: “I cannot believe, although in ways I am not surprised, that I have to bring such a motion to council tonight. It feels like I have gone full circle. She said: “I cannot stress strongly enough how vitally important it is to fill in the consultation document, above all else this is where numbers do matter. This is where your voice matters! The motion was seconded by her party colleague Alderman Arnold Hatch who said: “This is an issue which transcends party politics, there is no need for any posturing here tonight. “This cuts through everything in life for all of us, and unfortunately will probably affect all of us or our loved ones and some stage in life. “We have a top class service here in Craigavon Area Hospital and we should put our shoulders to the wheel and do all in our power to retain this service.